Valkee’s chairman Timo Ahopelto has written an incredible statement in Finnish, which was not translated into English. In a few seconds you will understand, why Valkee keeps this from foreigners. Actually, it tells all about Valkee’s public image in Finland. It takes a lot to refrain from commenting, as the author of this site is adressed agressively by Ahopelto (who even waggles the nazi card in the end). Read for yourselves, which conspiracies Valkee unravels. Images and links added. “Valkee seems to be the world’s only scientific innovation, about which everybody has an opinion. It tears down fences by bringing science straight to the customer, and that is apparently just what annoys. Valkee annoys so much, the row has got inconceivable dimensions. Rumours and hearsay have turned into facts even in intelligent people. “I don’t know any other small business, that was attacked by such masses of fulltime critics. Those people call in their free time journalists writing about Valkee, and tell anonymously that Valkee is a scam. Among the world brands, not even Apple has met such fanatism. “This journalism, which messes up fact and fiction, started with YLE’s MOT TV program. The crew contacted us – and, without our knowledge, also our collaborators – on Christmas 2011 in an ambush. The reporter told, that according to reliable sources Valkee is hiding state subsidies in offshore accounts, and that there were incoherences in our accounting. This hefty claim vanished when I told the reporter how to read finnish balance sheets. The program was finally produced, despite of this. It’s a pity that we didn’t correct all the errors then. MOT is fuel that is still burning. “The opinion of a small, but noisy group of skeptics has risen and turned into a fact, which is cited by others. It’s neither the people’s nor the media’s fault, but if you look into Valkee, you get a textbook example of a chinese whisper, and how skillfully presented rumours turn into facts in the people’s minds. It would pay off for every PR company to hire Valkee’s critics, because their media work is really skilled and efficient. However, I know that the people will understand the truth in the end. “In the following, three things which are systematically presented as true, while they are not. I could go on with the list up to 20. “1. 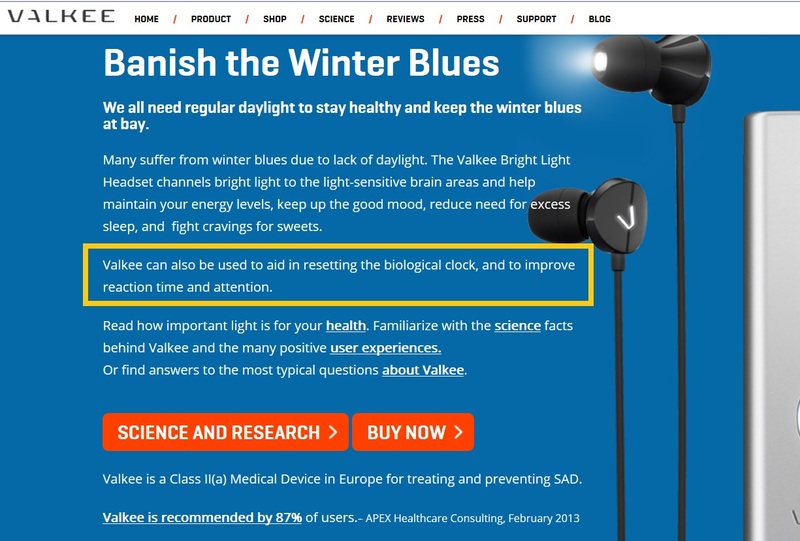 Valkee claims, that the bright light earbuds work against nearly anything. If you really get familiar with Valkee’s stuff, you will note soon that the only health claim is about easing the symptoms of winter depression. Timo Partonen, MD from the National Institute of Health and Welfare has researched winter depression mainly with regular Philips bright light lamps. According to him, symptoms of winter depression are for instance increased appetite, sleep problems and craving for sweets. Valkee claims nothing else than to relieve winter depression and its symptoms. “We have presented our studies on scientific conferences and reported results in the treatment of anxiety, cognitive performance and jet lag [where?/-ed.]. There is a really big difference between telling results on conferences and marketing claims. They cannot be mixed up. The whole pharmaceutical and medical devices industry works this way. All companies work this way: They are allowed to tell, and have to tell, what they are doing. “I’d think that the reason for this misconception is the critics’ sloppy reading of Valkee’s material, social media users that comment freely on Valkee with different intentions, and the reckless marketing by some of our resellers. All this has given ground to the idea, that Valkee claims. But that’s not true, and we are very strict about this. 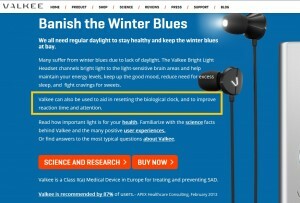 Valkee is only speaking of winter blues, and you can check this from the company website. “2. Valkee’s marketing is illegal and officials cracked down on this. I’ve had three roles at Valkee since 2009: investor, CEO and member of the board. During this time, the overseeing authorities never notified Valkee about any violation, and we were not forced to modify our marketing. I personally felt that the cooperation with the authorities – Valvira, VTT, and the equivalent bodies abroad – was really constructive and professional. “The rumour about an official crackdown on Valkee’s marketing began with an YLE radio reporter, had swolen in YLE’s web service and was translated into english in the end. The reporter had obviously read the blog of a certain noisy skeptic and mistook it for a reliable source. YLE modified the story upon our request, but the damage was already done: Noisy skeptics repeated the thing, which was then taken up by the mass media as a truth, they did not bother to check it. Fortunately, the world’s supervising authorities for medical devices consider research instead of hearsay. “3. 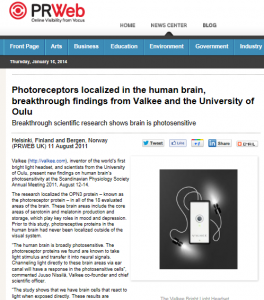 Valkee’s efficacy was not demonstrated, and light does not reach the brain. It takes a lot to say, that two trials in winter depression, which showed a 74-92% treatment response, a double-blind anxiety study, and a controlled trial on cognitive performance would not demonstrate, that a person’s mood elevates while using Valkee. It is also a bold claim, that light does not reach the brain via the ear canal, when a double-blind MRI study showed an activation of the brain without any light passing to the eye. These results cannot simply be coincidential, or a placebo effect. Sometimes it feels like also objective persons are losing their capability to understand things, painting all just black and white from their dugouts. “With the current media attitude, it is very simple to find always a new researcher to criticize Valkee’s studies. After all this rumble, when an academic is asked, he has no other choice than to comment, that more research is warranted. Nobody else than Valkee’s tenacious entrepreneurs and the brave researchers from the University of Oulu is ready to testify with their name. Against a common belief, besides the company’s founder Juuso Nissilä, they have no substantial commercial interests in the company. “Valkee also made a number of traditional bright light researchers to declare war. That’s always happening in science: The discoverer of the New faces the resistance of the Old. “It is correct, that Valkee’s science and research is just in its beginning, but the evidence is already very strong. Of course, everything can be criticized. 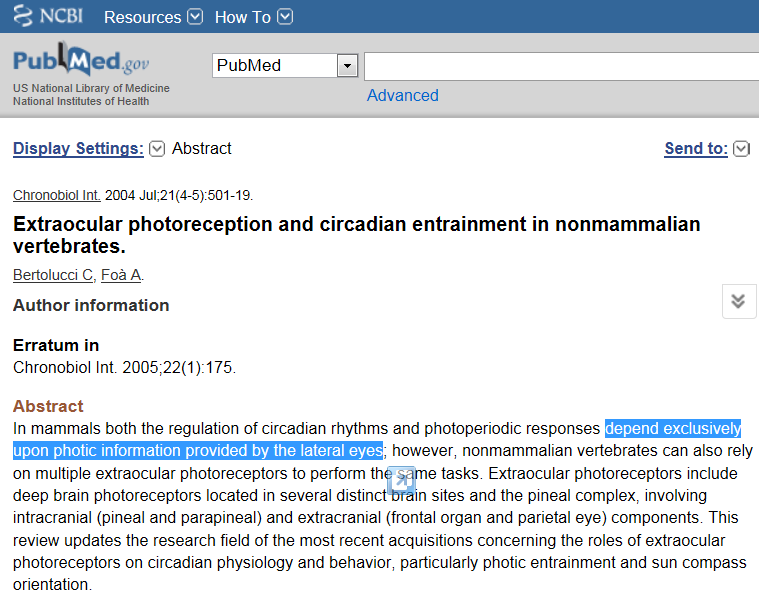 If somebody tells hat usual bright light is proven effective, and that it works through the eyes, then I can respond: show me a study, which demonstrates that bright light works only through the eyes. I tell you, such a study does not exist. In all bright light trials the whole head is illuminated by high power lamps. In science, you can’t take anything for granted, it goes ahead with new discoveries. 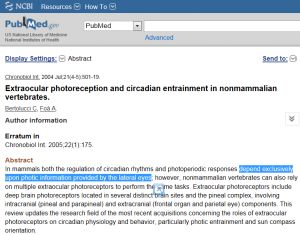 non-existent in hamsters – but in humans? When Valkee was on the verge of bancruptcy in spring 2011, left with a negative placebo-controlled trial and no money, they needed positive results fast. They came up with an extremely simple and fast-to-breed histochemic thing, some protein found in all brain regions they chose. The low-impact test was for Valkee’s PR machine an international scientific breakthrough. The poor encephalopsin was named “OPN3” and mutated to be “known as the photoreceptor protein”. Oulu’s local paper Kaleva was one of the first targets. A patriotic article about the “breakthrough” appeared soon. 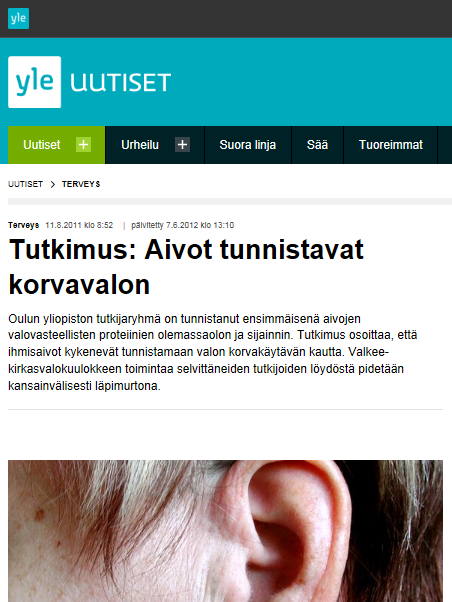 From there, it spread widely and reached even the respected YLE TV news. Now, it was no longer a protein with unknown function, it was the human brain being photoreceptive. And, miraculously the earlight was overnight working as claimed – in the press. 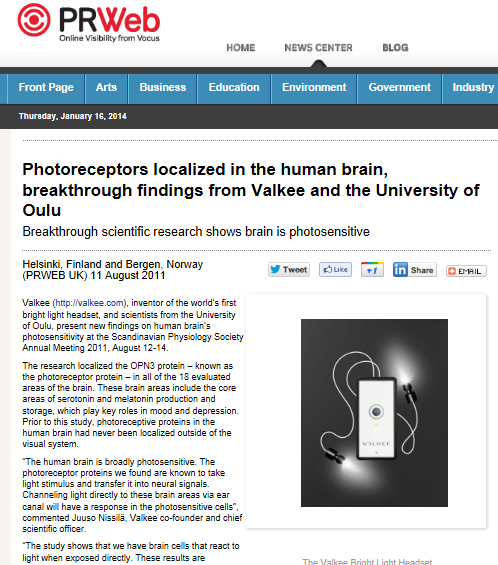 Valkee’s then-new CEO Timo Ahopelto said straight, that Valkee had just made the human brain photosensitive. They really did. 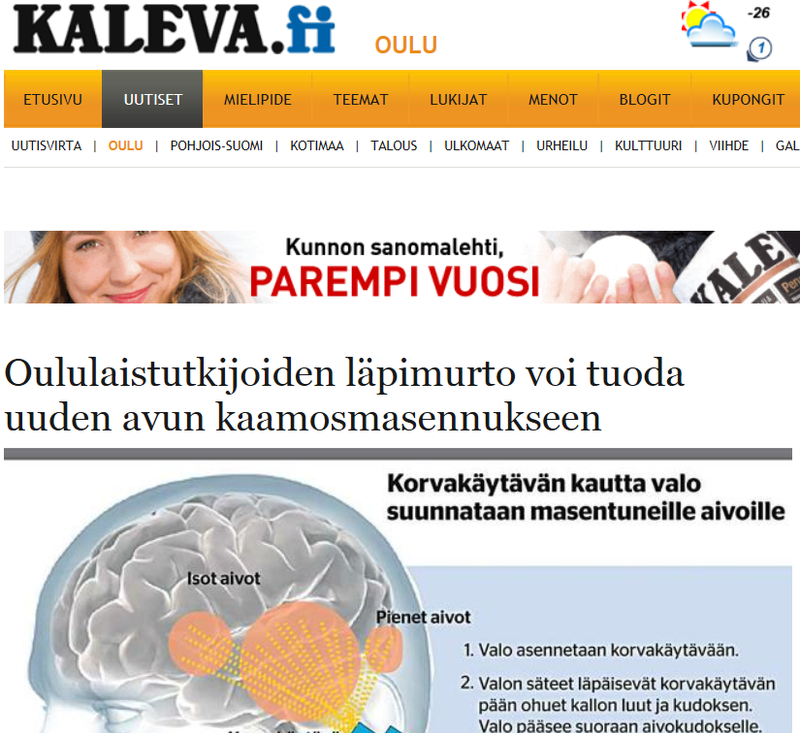 Now it’s the third year since this very finnish scientific breakthrough, and still no journal has showed mercy and found some pages for the poor study. 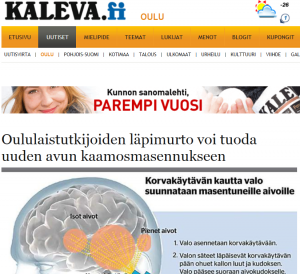 The only echo has been in the Journal of the Finnish Medical Association, mocking about the idea that a protein could mean something for the treatment’s efficacy. Still waiting. It must be the conspiracy of journal editors and industry, which Valkee’s Juuso Nissilä was speaking of, that hinders publication of these grandiotic findings. You have to remember, that those colleagues who accept new research articles into the journals, they have their own paradigms and also connections to the industry. What would this society be without this kind of journalism?